Our Vandas are doing really well in our Warm Asia section and we have one of our smaller Vanda species today. Vanda curvifolia is found from Assam to South East Asia and we have seen the species growing in Laos in hot lowland forest in semi deciduous trees where it experiences a hot wet summer, a slightly cooler dry winter and a hot dry spring before flowering in April. It grown on the trunks and branches of trees where there is no moss and exposed to bright light especially when the trees shed leaves in the dry season. 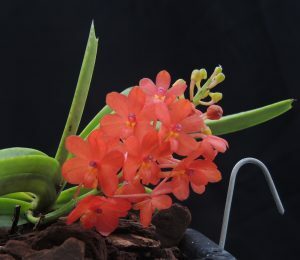 Ascocentrum species are small growing plants that have recently been subsumed within the genus Vanda. This makes good sense on the basis of hybridisation as well as genetics, as Ascocentrum species have been used a lot in Vanda breeding to give smaller growing and brightly coloured hybrids.